The administration line item, worth $839,100, simply covers personnel and operational costs for the program. Government art subsidies corrupt artists. Subsidies gradually but inevitably lead to the "dumbing down" of art as the hopeful beneficiaries of government grants tailor their craft in such a way as to make them most likely to receive state money. In other words, because there never will be enough money for every aspiring artist, the state must of necessity develop a selection process; thus artists applying for grants will tend to pursue work palatable mainly to their government patrons. Some writers have recognized the artist’s need for independence and warned against this dynamic. Nobel Prize-winning novelist William Faulkner remarked, "I’ve never known anything good in writing to come from having accepted any free gift of money. The good writer never applies to a foundation. He’s too busy writing something." Faulkner’s fellow Nobel laureate, one-time Michigan resident Ernest Hemingway, said that a writer who uses politics to advance his career might "get to be an ambassador or have a million copies of his book printed by the government," but he is betraying his craft. Savings: $11,771,300. 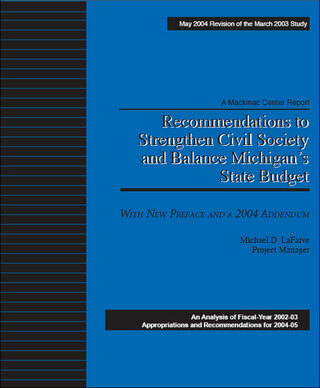 Governor Granholm’s 2005 proposal increases the gross appropriation to $12,479,200.